Early voting turnout is up this year in Maryland compared with the last midterm election, and about 109,000 people cast ballots during the last two days of early voting, which ended Thursday night. The reason for the bump in the last two days is not entirely clear. While a wave of big-name politicians came through the state in recent days and weeks, people often put off early voting until the last minute. About 8.3 percent of eligible voters, 307,646 of them, cast ballots during eight days of early voting, up from 6.3 percent in 2010. There were two extra days of early voting this year. Lt. Gov. 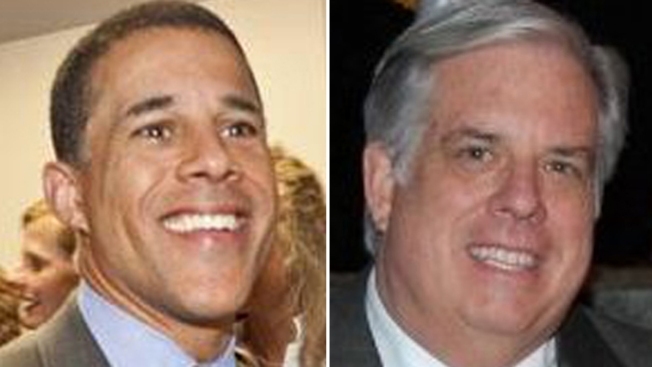 Anthony Brown, a Democrat, and Republican Larry Hogan are heading into a busy weekend before Election Day after a dismal 4.2 percent early voting turnout in the June primary. Overall, turnout in the primary was only about 23 percent, which was very low even for a non-presidential election. Polls have showed Brown leading the race. Both candidates have focused on energizing voters in recent weeks. The campaign has been heavily characterized by negative advertising in a competitive race in a state where Democrats hold a 2-1 edge over Republicans in voter registration. Some voters, however, are far more ambivalent than energized. Rob Fettus, 50, said he's not sure about Brown's administrative skills, and he also is unsure about Hogan's positions on social issues. Fettus said he remains undecided. "I'm not usually in that frame of mind,'' Fettus, a Democrat, said at the Annapolis City Dock, where he had recently docked his boat. Michael O'Brien, another Annapolis Democrat, said he hasn't decided, although he was leaning toward Brown. He cited the lieutenant governor's nearly 30 years of military service in the Army and reserves, as well as his educational background from Harvard University. "I'll probably vote for Brown,'' O'Brien, 59, said. Jerry West said he was voting for Hogan, even though West is a Democrat. "We need a change,'' West, of Odenton, said. Early voting turnout was low in Montgomery County, the state's most populated jurisdiction, where 5.6 percent of 624,659 eligible voters cast ballots. Brown has brought in some of the biggest names in Democratic politics to try to fire up his base. President Barack Obama came to a get-out-the-vote rally earlier this month in Prince George's County -- Brown's home and the state's second-most populated county. Hillary Rodham Clinton also visited in the county on Thursday. First lady Michelle Obama is scheduled to attend a rally on Monday in Baltimore. Early voting turnout was 8.5 percent in Prince George's County. Hogan has had three campaign stops by New Jersey Gov. Chris Christie, and a fourth is scheduled for Sunday in Baltimore. Hogan also had a fundraiser with former U.S. Secretary of Homeland Security Tom Ridge. Early voting turnout was 10 percent in Baltimore County, which has the third most eligible voters in the state. It was 7 percent in Baltimore city, home to the fourth-highest number of eligible voters in Maryland.